Since Lebron opted out of his contract with the Miami Heat, the big question now is - which NBA team will he play for next year? After hearing the news he had opted out, I immediately got on the phone and contacted my sources in the NBA to get the lowdown on where he might end up next. They tell me that he definitely plans to leave Miami and has narrowed down where he would like to play to seven teams. Where he wants to play might surprise you. I know I was taken by complete surprise as no major media outlet will report the truth about his plans. Before I get into the options he is exploring, I think it's important to get a feel for Lebron's mindset right now. Let's not forget that he was widely criticized for leaving Cleveland and he's human and does feel pretty bad about that. He's also been criticized for passing the ball to the open man in big shot situations. Although he got the big monkey off his back by getting two rings, he does have to deal with two failed championship runs including getting man handled by San Antonio in this year's finals. Oh, and of course, we all know any team that has been to four straight finals must under take a major overhaul in order to continue that success too - right? What I'm hearing from my people in Lebron's camp is this. He's tired of hearing it from the critics and he's tired of being hated around the league. Because of that, the solution he has come up with is that he wants to do something really BIG and something that no other superstar in the present free agent era has ever succeeded in doing before him - not even himself. In fact, it would be unprecedented. Bring a championship to a team that can't win one because it can't draw free agents like the Laker's, the Knicks's and the Bull's. After all, when you think about it, it's should be pretty easy to win a championship with the Lakers. With the media lobbying every single player that becomes a free agent to the Lakers even the ones from the big markets. I mean, come on, how hard is that to do when it's easy to get players to come play there (and even take paycuts), really? Now, the big media companies such as ESPN will have you believe that he's only interested in the Lakers with all their championship banners, the big endorsement deals, the hot women and the scenic views, but that's just wishful thinking on their part. He doesn't want any of that because I've been told that's not him. He, like me, is supremely disappointed that whenever a player becomes a free agent that the media always reports that player is going to LA Lakers, Chicago or New York and not to a small market team like Milwaukee, Minnesota, Utah or the team that many free agents must play for on their way to the big market - Toronto. Lebron has gone even farther though and told his inner circle that one thing he loves is an underdog and that he wants to go be one - and make it as hard as possible to win a championship. That way, he can truly do something most superstars can never do - bring a championship to a team that otherwise would not get one - and be considered great for it. After all, if you can win a championship on a team where no one wants to play, then you must truly be a great player because so few have done it. Let's have a look at a few players on the list of guys who couldn't win on teams no one wants to play for. The list goes on to players like Ray Allen, Pete Maravich and even Lebron couldn't do it in Cleveland before he got talked out of town. The good news is, there are a lots of teams to choose from. All of which haven't won a championship and all of which Lebron could, if interested, take a paycut to play for just like he could do with a team like the Lakers. Not only that, they would also be willing to partner him up with Melo in the process if he would take a paycut as well to win the big one. So let's look at the list of a few NBA teams that haven't won a championship that surprisingly ESPN never usually reports a major free agent is reportedly going to even if they had unlimited cap room. Pretty surprising considering that list is nearly half the league. Thirteen of the thirty NBA teams have never won a championship. I'd be willing to wager money that nearly every team on that list will never win a championship, at least half the list. My sources tell me that 13 teams was too big of a list and that Lebron asked them to pare down the list to a smaller group. After all, he argued, teams like Utah, Indiana and his past Cavaliers teams have been to the finals. At least they have had a shot. He wanted a list of teams that have never been to the finals. They presented this list to Lebron who commented that it was still a quarter of the league and he kind of chuckled and asked his entourage what team they thought had the worst reputation in league history. That's when one of them spoke up and said do you know what a Los Angeles Clippers fan does after his team wins a championship? He told him they turn off their Playstation 4. At that point everyone was rolling on the floor laughing and the decision was made that since the Clippers had been in the league since 1970, were notoriously known as being the league losers and the stepchild to the Lakers that it was indeed the epitome of a bad franchise - probably the worst in history. After all they said, we already know if you go to Toronto and drive to the basket and get clobbered in the playoffs they aren't going to call it. At least because the Clippers are still in LA, you probably will still get the calls. That's not going to happen in a small market. Even Lebron had to admit that was true. So, ironically, the worst team in the league is still a big market and yet, you heard it here first. Lebron will be a Clipper next year. After a long season and a grueling but exciting playoff, the Coach2K Finals have arrived and will start Monday, June 9, 2014 at approximately 9:15pm ET. It will feature the Eastern Conference champion PSN Alabamarob Hawks vs the Western Conference champion PSN Yung_Ballin Pelicans. 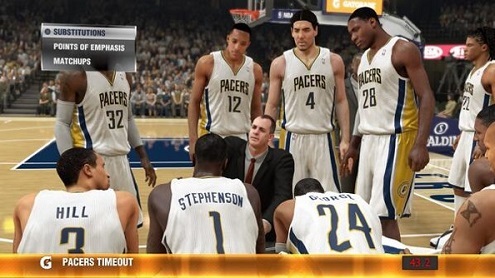 The Coach2K League is the only league I know of playing any organized NBA2K. This is a best of seven series and game one will be held in Atlanta. 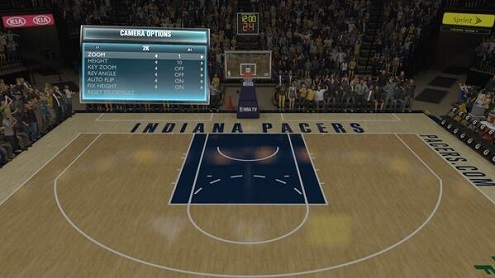 The settings will be 12 minute quarters, hall of fame difficulty and simulation sliders. This is a man's game played on manly settings. No six minute quarters with quick match settings here. These are full games. Thanks to the new streaming function, the game will be available live on Twitch and you can catch game one on twitch.tv/alabamarob channel. For us in the league being able to see the action live is pretty awesome so I'm hoping more will tune in. I've often found myself watching NBA on TV and two league games at the same time on my computer and paying more attention to the league games! What's great about this matchup is that Alabamarob uses his hometown Hawks while Yung_Ballin uses his hometown Pelicans. If you know anything about me, I look for guys that play with their hometown teams and since both of these guys represent their hometown squads, I love that. You'll find this to be interesting matchup. Alabamarob is a very methodical, patient and skilled player and Yung_Ballin is an aggressive defender with excellent stick skills. I'm excited to see how this series plays out. I hope you check out game 1. These are great players who I think represent the league very well. In the meantime, you can check out some old footage of games I've played versus each of these guys if you'd like. I've posted both below. The lockdown defender is a player known for his perimeter defensive prowess. While playing defense, this player automatically neutralizes the offensive signature skills of the player he is actively guarding. Who Are The Lockdown Defenders? 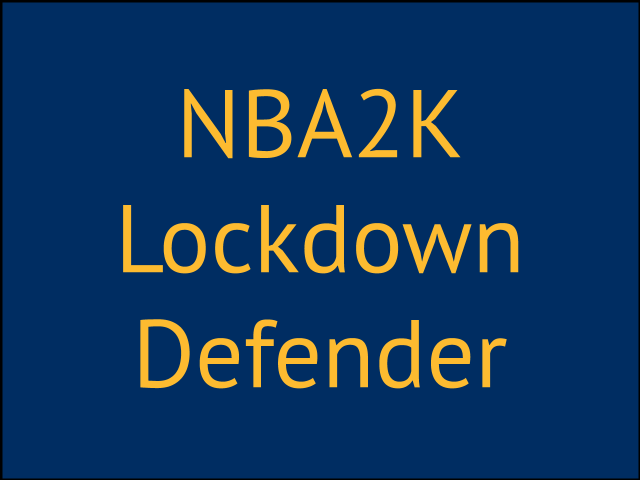 [catalyst_hook_box name="googleinpost"]Currently there are 12 lockdown defenders in NBA2K. Broken down by position, there are one point guard, five shooting guards, five small forwards and one power forward. Chris Paul, PG, Los Angeles Clippers: Chris Paul is a great on ball defender with a high steal rating and a high defensive awareness. He also has the Pick Pocket signature skill which goes well with his high steal rating. Avery Bradley, SG, Boston Celtics: Avery Bradley is one of the best on ball defenders in the game. He has high defensive awareness and the signature skill Active Hands. Jimmy Butler, SG, Chicago Bulls: Jimmy Butler is a good on ball defender and has high defensive awareness with an average steal rating. He has no additional defensive signature skills to complement his lockdown defender status. Tony Allen, SG, Memphis Grizzlies: Tony Allen is an elite on ball defender with high defensive awareness and good steal rating. To go along with his lockdown defender signature skill, he also has the Active Hands and Scrapper signature skills. In addition to that, he possesses the Enforcer badge which probably provides some intangible bump to his defensive abilities. Danny Green, SG, San Antonio Spurs: Danny Green is a good defender. He will play solid defense but lacks additional signature skills or elite defensive ratings. Thabo Sefolosha, SG, Oklahoma City Thunder: Thabo Sefolosha is a great on ball defender with high defensive awareness. He has Active Hands to go along with Lockdown Defender. Lebron James, SF, Miami Heat: As the highest overall rated player in the game at 99, it makes sense that Lebron James would have the Lockdown Defender signature skill. He also has the Chasedown Artist and Interceptor signature skill. Paul George, SF, Indiana Pacers: Paul George is a very good defender. He possesses great on ball defensive skills as well as high defensive awareness. In addition to the lockdown defender he also has three other defensive signature skills; Interceptor, Active Hands and Pick Pocket - as well as some badges that could enhance his defensive rhythm. Andre Iguodala, SF, Golden State Warriors: Andre Iguodala is a great defender with Interceptor and the badge enforcer. Luol Dang, SF, Cleveland Cavaliers: Luol Dang is a great defender who use to play with the Chicago Bulls along side two other lockdown defenders. He doesn't have any additional defensive signature skills. Luc Mbah A Moute, SF, Minnesota Timberwolves: As one of the lowest overall rated lockdown defenders, Luc is a good defender with the Scrapper signature skill. Taj Gibson, PF, Chicago Bulls: Taj is the only power forward with the Lockdown Defender signature skill. He doesn't have any additional signature skills but does have a 99 block rating which also helps him inside. Other lockdown defenders: In addition to the current NBA lockdown defenders, I found it interesting that the Euroleague has 10 lockdown defenders. Of course, the classic rosters have their fair share of lockdown defenders. You'll find multiple Michael, Jordans, Scottie Pippens, Jerry Wests and others like Gary Payton. Some of the best players in the game have at least five signature skills. The lockdown defender neutralizes the offensive signature skills of the player he is actively guarding. If it's not a natural match up by position, you'll want to consider using your lockdown defender on another strong offensive player to help contain them. This would be especially important versus players who know their teams really well and who also take advantage of their players offensive signature skills. You might want to move your lockdown defender over to that kind of player. Just remember that there is a difference between ratings and signature skills. 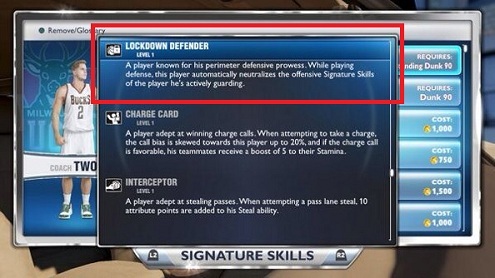 The lockdown signature skill doesn't neutralize ratings. Ratings neutralize ratings along with your skills controlling the players. While it's possible to lockdown players in NBA2K with non-elite defenders, the lockdown defender skill just makes it easier for you to do. And remember, just because you have a lockdown defender doesn't mean he will lock anyone down without your help. The Lockdown Defender signature skill is the most powerful defensive signature skill. If you are a perimeter player playing the one, two or three spot, you'll definitely want to add it. It has three levels in my player. Because there are three levels, it makes me think that there are degrees in the lockdown status among the group of players listed above. Who do you think is the best lockdown defender in the game? 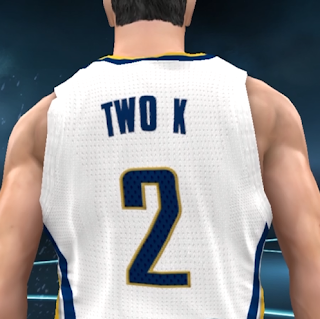 If you were making the rosters, do you feel that NBA2K correctly identified the right lockdown defenders. If not, who would be on your list? 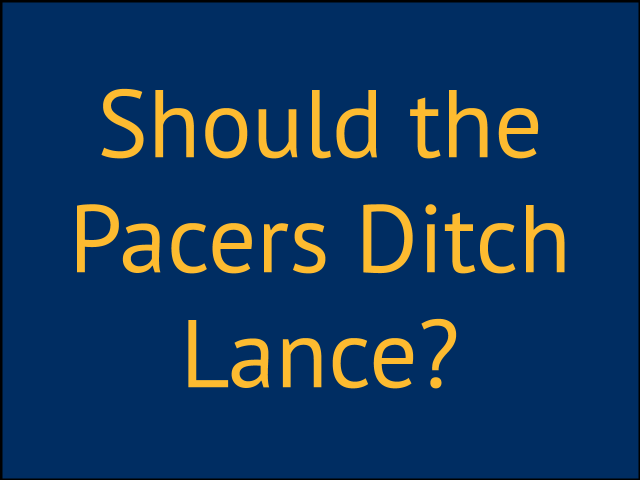 Should The Pacers Get Rid Of Lance? 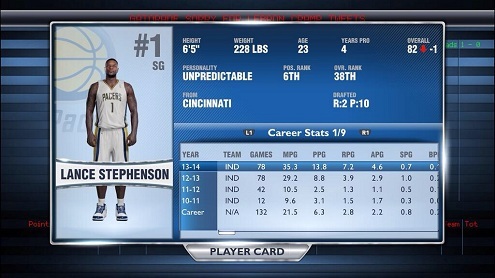 During the 2014 playoffs, much was made about the Lance Stephenson show. Many in the media as well as fans in Indiana questioned whether Lance is someone that Indiana should re-sign because of these antics. I thought I would weigh in on this question. My personal opinion is that the Pacers should indeed re-sign Lance if they can afford him after he tests the free agent waters. Lance after all, led the league in triple doubles this year. The reason I feel this way is because I think that the fans here in Indiana underestimate just how hard it is to get to the conference finals and overestimate how easy it is to draw free agents to Indiana. What Lance did in the playoffs this year, while it could be argued is a disgrace to the game, was actually pretty harmless. With the exception of his foul to the forehead of one of the Heat players, most of this was mental games. Udonis Haslem punching Tyler Hansbrough in the nose and not even going for the ball as retribution for a hard foul on the other end. Dwayne Wade outright tackling Darren Collison on the fast break and not getting ejected or fined. Wade doing stuff like that is not an isolated incident. Dexter Pittman going out of his way to clobber Lance in the jaw because he made a choke sign in a prior game. I don't recall anyone saying that Wade should leave Miami after his incidents. I don't recall anyone suggesting that Haslem leave the Heat. And everyone knew that Pittman went after Lance for Lebron probably at the blessing of his team and I think in addition to the penalties he got, the team should have been fined. All three of these incidents weren't even basketball plays and yet could have done some real harm to the players involved and I also didn't hear that it was a disgrace to the game except from maybe the guys on TNT the night it happened. Why is it that if an Indiana Pacer player acts up, they have to immediately start thinking about moving that player? The answer is, they don't. The only people that think they do are the reporters in the media and those in the larger markets whose mission seems to be to always talk talent out of small markets into the larger markets - one way or the other. Especially when teams like LA, Boston and New York didn't even make the playoffs. And while I love Jeff VanGundy as a coach, he almost always recommends physical retribution suggesting that when Lance went into an informal huddle - which wasn't even a formal timeout - that strong force be used to remove him. So it seems hypocritical to want to get rid of Lance for sticking his hand in Lebron's face after Lebron basically did the same thing on Lance's jump shot on the other end. That being said, once the Pacers have talented players in Indiana, it's pretty important that they work to keep them. When you look at the Pacers potential, getting the conference finals is the ceiling in my opinion. It's almost as good as a championship. While I and those fans in Indiana would love a championship, it's also important to realize that whenever we get to the conference finals, there's most likely going to be one of the best players in the world on the other team. I'm referring to Lebron now and Michael Jordan in the 90's. The Heat team that beat Indiana had three hall of famers on it in James, Wade and Allen. How many did Indiana have? Supreme superstars like those just don't come to Indiana through free agency. They go to the big market teams. And with free agency, that's what all players would prefer to do. I mean, who wouldn't, really? If you are given a chance between Minnesota and Boston like Kevin Garnett was, you would do the same thing. Even Chris Copeland didn't want to play in Indiana even though the team had a realistic chance to compete for a championship. That should tell you something about how hard it is to get players to play for the Pacers when role players don't even want to sign here. In order for Indiana to get a superstar, they have to draft him and groom him into one. So I have to laugh when I even hear thoughts of how the "media" thinks the Pacers should even consider not signing Lance or entertain thoughts of breaking up a team that has just made two consecutive trips to the conference finals. It's time to look for better role players and not dismantle the team. And that process starts by re-signing Lance if they can do it. For the media, it's time to start review what disgrace to the game really looks like. 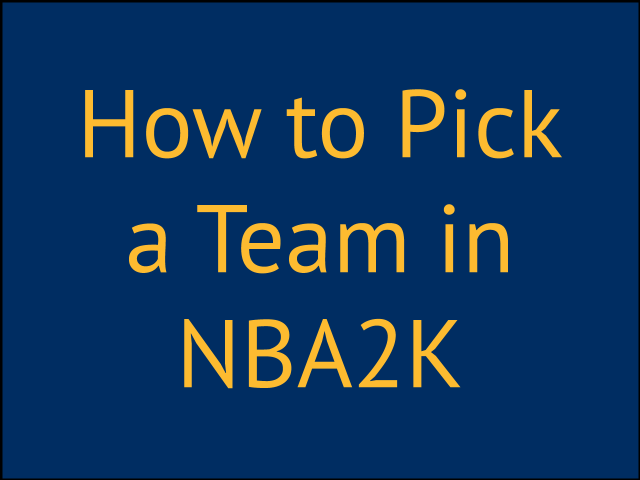 It's my belief that in order to become a hall of fame level player in NBA2K, you need to pick one team, use it all of the time and make it your mission to master every player on that team's roster. 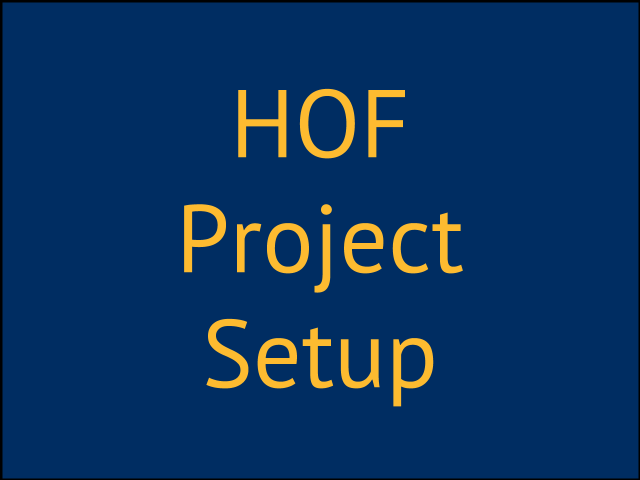 Picking a team to use is the first challenge that many people face so here are a few ideas on how to pick the right team for your own personal hall of fame project. Pick your hometown team. The most obvious place to start is with a team that you follow closely. If you are from Milwaukee and you watch all of the Bucks games then it certainly makes sense for someone like you to use a team like Milwaukee. You, above all other people in the 2K community, would be the best choice to represent Milwaukee. I'm a good example of that. I've watched the Pacers since the 80's, was a season ticket holder for awhile and been a fan forever. If you knew all that before you played me and then we happened to square off in a match, it would probably take you by complete surprise if I selected the Heat just because they have Lebron, Wade and Allen. People do that all of the time. Why is that? The problem is that a lot of the time, the team that we love stinks in the game and so what people opt to do is use an elite team instead because it's just easier. If you are a veteran of the NBA2K franchise, I would always lean you towards using your home town team whether they were good or not. Pick an elite "big market" team. I guess the ideal situation would be that your home town team is a big market team with good players on it. You live in New York and use the Knicks. Then, it would certainly makes sense for you to use that team. If that were the case, I'd really would want you to use Knicks just like if you lived in Milwaukee I would really want you to use the Bucks. Given a choice between playing someone who had lived in New York and followed them closely, and some guy from Orlando using them, I'd want to play the guy from New York all day long and rather see the Orlando guy using the Magic. Exception: If you are brand new to the game, it probably does make sense for you to use an elite team when you are starting out. Higher rated teams are more forgiving when you make mistakes which you will definitely do when you are learning the game. When I started out. I used the Kobe Bryant led Lakers for about a 100 games until I got comfortable with the game and then I made my move to the Pacers. Picking a team when you have no hometown team: Now, it's always possible that you don't have a hometown team. Maybe you live overseas or in Arkansas where they don't have a team. What team do you pick then? Well, that's going to depend. What I would probably suggest then is that you choose a team that you have some sort of connection with. Maybe you used to live in Sacramento and choose to use the Kings or maybe use a team that has a player who played college ball at a university you are a fan of, maybe pick a team that is geographically closest to you or maybe pick a project team. Pick a project team: The main thing I always love to see is people using home town teams. A close second is using teams that no one uses. There are certain teams in the NBA that just have no true fans that use them or at least if they do, I haven't spotted them in the 2K community. Some of those teams are teams like Utah and surprisingly at the moment San Antonio who has been in the finals for the last two years as I write this. If I didn't have a team, I'd probably use a team like Utah because I've traveled to Utah a bunch of times and once met one of their players and I know that the chances I would run into another Jazz user is small at best. Pick a team based on your current skill level. One last approach I would give you is to pick a team based on your skill level. If you had to rank your ability to play the game as a rookie, pro, all star, superstar or hall of fame level player, what would it be. If you are brand new to the game, I would consider you a player at a rookie skill level. If you have been playing awhile and usually set the game to pro difficulty and do fine but struggle to win at all-star difficulty level, then you might be a pro level player. It's not an exact science so you'll just want to get close. Once you've estimated your current skill level, then rank the teams based on how hard or easy they might be to use and pick one at your current skill level or one step above your skill level. At the beginning of each new season, I like to rank the teams based on how hard or easy I think they will be to use in NBA2K. I break each team down based on the number of 90+ rated guys, 80+ rated guys, 70+ rated guys, 60+ rated guys and 50+ rated guys each team has and I put it in a chart like below. 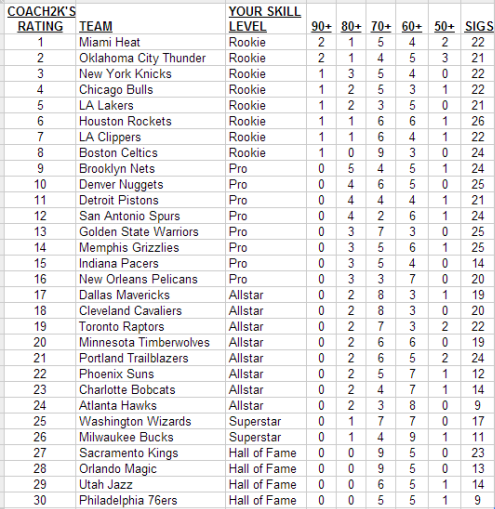 I've also started putting the number of signature skills a team has assigned to them on the chart as well because a team with more signature skills will have a slight advantage and a team like Sacramento which has 23 signature skills is probably going to play a lot better than I might have them ranked in the 27th spot to start the year in which I put the chart together. Once I've got the teams ranked, my rationale works like this. Setting aside signature skills, teams with a collection of guys rated over 90+ and 80+ are going to be easier to use than teams that don't have anyone over 80 or 90 on the team. I consider teams that have a bunch of guys rated high easier to use. On the chart, I listed a current skill level as well. You'll notice that teams like the Heat and the Thunder are teams I consider to be more appropriate for players who might be rookies to the game while teams like the 76ers and the Jazz, I think you would need to be a hall of fame level player to win with them. This is my way to essentially "handicap" the teams to evenly match players who might go head to head. A rookie level player using the Thunder might play a hall of fame level player in an evenly matched game using the 76ers if they played head to head. However, if you have a hall of fame level player using the Thunder, you'll definitely have a pretty formidable opponent. Versus the CPU, and for the purposes of the hall of fame project, a chart like this also will tell you how hard it's going to be win with that team on hall of fame level difficulty. The father down the list you pick your team, the more challenging it will be to compete and win on hall of fame level and you'll have to game plan and execute at a high level. When we start playing the hall of fame CPU, we will use this chart again and start playing versus the worst teams in the league and work our way up the team difficulty chart, like a ladder, knocking off one team and moving up one rung of the ladder at a time. As a final note, when it comes to team selection, I've played a lot of guys that "switch" teams for whatever reason. What I've noticed is that for the most part that they play the same way with all of them. It's more a matter if the team they play matches their play style how well they do. In my case, I'm a natural chucker. I like to shoot the ball so I'll do better with a team that shoots threes than one that can't. But if you put me on another team, there won't be much difference in how I play and that's what I've noticed about most people who change around. Play style is pretty constant and success depends on how well the team adapts to what they normally do anyway. And that's all the more reason to stick with one team and master it. Ultimately, I don't think it matters what team you choose, I think you can win with all of them once you get good enough. What matters more is you pick one and get to work mastering it. My son and I go to a nearby park to practice basketball all of the time. Often when we get there, the goals have been adjusted. Sometimes they are at 8 feet, sometimes 9 feet and sometimes they are even over 10 feet slightly. When we get to the park, we always adjust the goal to 10 feet. We call this process setting up the court to hall of fame difficulty. It may not seem like a big deal but if my son practiced on an 8 foot goal all of the time, he's not going to be prepared to shoot on a 10 foot goal in a real game. It's important for him to prepare for real games on the same height goal he will shoot on in a real game. NBA2K is pretty much the same. If you want to be a hall of fame level player, then you have to practice on those settings. What you want is consistency from mode to mode so that when you play a game, everything is essentially set to 10 feet. Here are the things I adjust when I get the game for the first time. Hall of fame difficulty: I set the difficulty level to hall of fame level across all modes. This is most important in free style practice mode. There are shorter windows for getting shot releases correct when you practice on hall of fame versus practicing on rookie. Basically rookie is more forgiving than pro which is more forgiving than all star and so on. While I often play games at a lower difficulty level (often playing on rookie), I always practice in free style mode on hall of fame. Simulation game style: Debate rages on sliders. Many are in favor of adjusting them although I am not. The reason I don't like to adjust them is because I want consistency in sliders both offline vs the CPU and online when I play other users. I don't want to get accustomed to an easier slider set offline and then struggle using a harder slider set online. To me the use of a consistent slider set is like setting the goal to 10 feet. I am aiming for consistency. 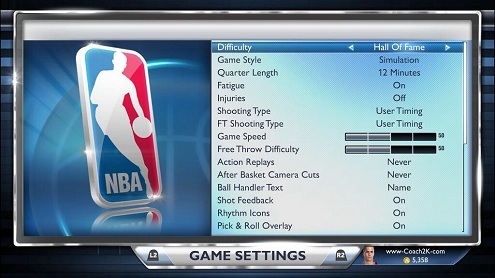 I also feel that once I change the sliders, if I make them easier, it's not really hall of fame difficulty anymore. I would encourage you to set the sliders to simulation and forget it because you will eventually adjust your on court decision making to the simulation slider set. The argument for revised slider sets is one based on getting realistic stats. In my mind that can be accomplished in two ways, one is forcing the game to create it and another is to obtain it through play making. I have found that once you get to know your team and your opponent, you can get to the point where realistic stats can be obtained through your play. Although this doesn't help get realistic stats for simulated games. 12 minute quarter length: I recommend that you work your way towards 12 minute quarters. I originally started at 5 minute quarters when I got my first hall of fame win. But in that win, I didn't have to really sub, deal with foul trouble or fatigue. These are all factors you should have to deal with and playing a full 12 minute quarter game brings all of those factors in. Fatigue: I set fatigue to on because I want guys to get tired when they play. Injuries: I set injuries to off (yet they still happen). Shooting type user timing: I always set my shot timing to user timing and not real field goal percentage. I do this because with real field goal percentage, you only have to make sure you get good shots, where with shot timing, you have to get good shots PLUS get the timing of the shot correct. To me, this makes every player unique and is a harder setting and that's why I use it. Game speed: I leave untouched at 50. Shot feedback, rhythm icons, pick and roll overlay: I turn all of these on to help me see what is going on with the players on the floor. 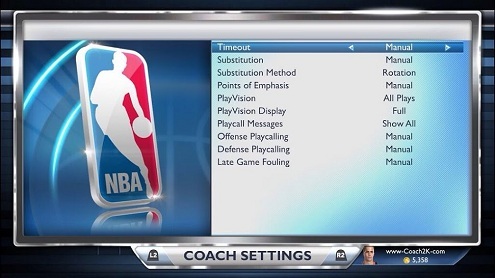 As far as coach settings, you can have success running these completely on auto versus the hall of fame CPU. Often, you'll find the need to change a few of them. Timeout: I prefer on manual especially versus other users as I don't mind playing guys tired. I'll often just leave to auto. I grew up in the shadow of Bob Knight at Indiana University who didn't believe in calling timeouts to stop momentum. Because of that I don't either. Substitution: While it's possible that it will work fine on auto, more often than not, you'll find that the CPU coach will make stupid substitutions. I've seen Luis Scola put in at the shooting guard spot before. You'll have to get to the point where you manage your rotations. Points of emphasis: I'm mixed on the importance of using auto or manual points of emphasis. I've won at a hall of fame level by using both methods. Like auto subs, the CPU coach can mess things up. Playvision: I set to all plays. Playvision display: I set to full. Playcall messages: I set to show all. Offense playcalling, defense playcalling and late game fouling: I set all of these to manual. 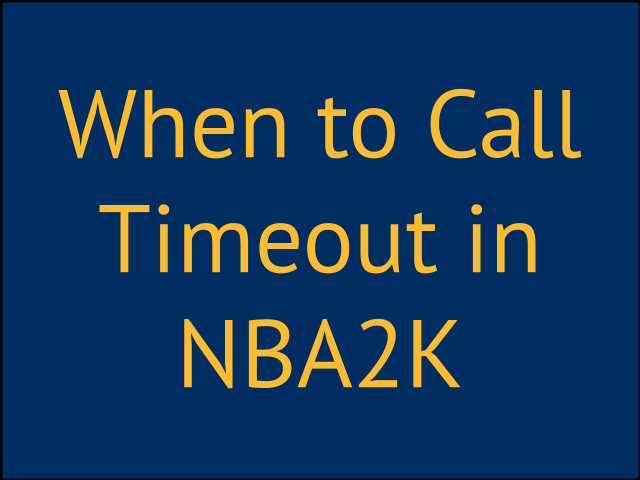 It is sometimes important to set the late game fouling to auto if you want to make sure you foul quickly. Many times though, the CPU will foul in situations where I might not decide to. I always use the same camera view in every mode I play. I would recommend this as well. This will help you have the same view on all shot releases. I prefer the 2K view when I play, but many good players I know play on broadcast. It's more important to use the same view across all modes that you prefer than to use the view that I do. There are some good roster sets out there. And often the game plays better with those rosters. I'm not opposed to using customized rosters (nor sliders for that matter), except for the sake of consistency. While I might prefer a customized roster, since it's different from the one I would have to use online if I play other users, it's an adjustment I don't want to have to make. 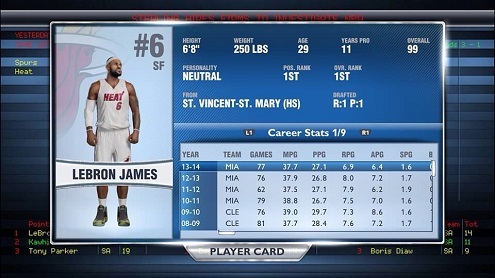 For that reason, I use the official NBA2K rosters for all hall of fame game play. What I'm after is a consistent, hall of fame level set up across every game mode and one you should strive for as well since you should want to represent your team both online versus users and offline versus the CPU.